MANSOURA, Egypt – A skeleton has been unearthed in Egypt’s Western Desert, where ancient sands have long helped preserve remains, but unlike most finds this one isn’t a mummy – it’s a dinosaur. In the article the authors say the team’s findings “counter hypotheses that dinosaur faunas of the African mainland were completely isolated” during the late Mesozoic period. Those theories were that Africa’s dinosaurs during that time existed as if on an island and developed independently from their northern cousins. While Egypt has a long history of archaeology, paleontology has not enjoyed the same popularity – or had the same success. The bones bear a resemblance to another dinosaur discovery in Egypt, that of the Paralititan Stromeri, excavated by an American team from the University of Pennsylvania, whose findings were published in 2001. Both were long-necked herbivores grazers, but the Paralititan Stromeri was much larger. It was among the largest known dinosaurs, weighing in at 75 tons and over 33 yards long. The Mansourasaurus’ smaller size is more typical of the Mesozoic era, when dinosaurs’ time was running out, geologically speaking, Sallam said. With a long neck and tail, its torso would have been similar to that of an African elephant and measuring tip-to-tale over 11 yards and weighing several tons. Finding the dinosaur remains in the vast desert was the product of back-breaking work. The team scoured the area of the find more than 466 miles southwest of the capital for five years before they found the partial skeleton of the Mansourasaurus in 2013. 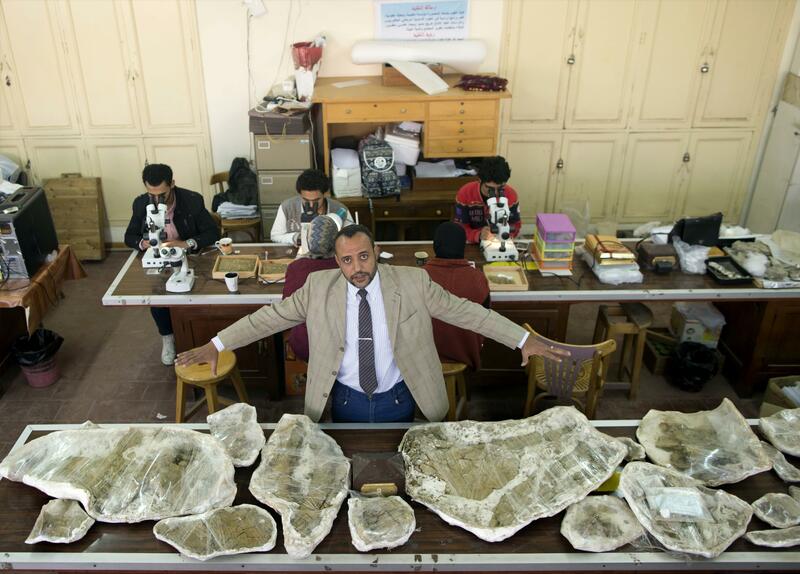 Sallam said he and a group of doctoral and master’s degree students were heading to give a lecture at a local university when they stumbled on a desert road with the appropriate geological outcroppings that they hadn’t noticed before. The next morning, the team returned to survey it, covering an area of several kilometers. It wasn’t long after they started that one of the students called him on the phone, saying he should come see the number of bones she’d found. “When I first saw it I told them, ‘If this comes out as I expect, your names will go down in history,’” he recalled. Published: Feb. 6, 2018, 4:11 p.m.